Green Bay, WI protests after DA refuses to charge killer cop | Fight Back! 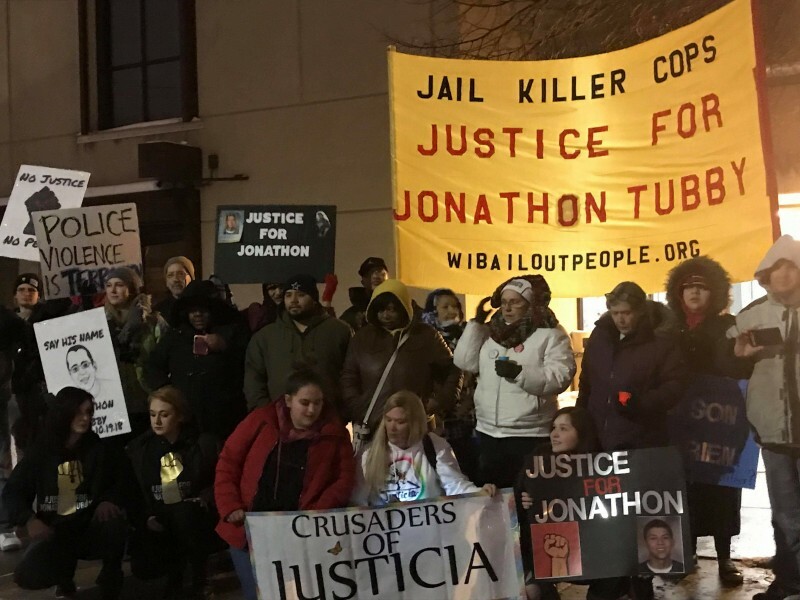 Green Bay, WI - After months of waiting for a decision, on February 1, the family, friends and supporters of Jonathon Tubby heard District Attorney David Lasees’ refusal to charge Officer Erik O'Brien. His decision has left many with questions, anger and confusion – not the answers they had sought. Tubby, a member of the Oneida Nation, was known as a warm, funny person who cared deeply for his friends and family. In pictures shared on his Facebook and other social media pages, his smile is the first thing that catches one's eye. On the evening of October 19, Tubby was taken to the Brown County Jail for booking after a traffic stop. According to the police, he did not comply with orders, keeping his right hand under his shirt out of sight. The officers claimed they thought he had a concealed weapon on his person even after being thoroughly searched upon arrest. In the few one-sided videos released by the DA, the police not only utilized their BearCat SWAT car during the altercation, but they also assaulted Tubby with a bean bag round, police dog and Mace. Tubby was ultimately shot five times from behind as he turned away from the officers. He was handcuffed and unarmed the entire time. There are no visual recording devices in the location where Tubby was murdered. District Attorney Lasee stated in his findings that "the self-defense privilege would apply in this case" due to the officers believing Tubby was armed. However, it is clear in what little so-called evidence was shared with the public that the aggressive approach by the police to the situation led to intense escalation, crisis and Tubby's death. Officer Erik O'Brien, the killer cop, is now on paid administrative leave out of concern for his safety, according to the Green Bay Police Chief Andrew Smith. The family has since released a statement on the findings of the DA Lasee, writing, "The District Attorney’s findings and conclusions are not facts, they are opinions of the District Attorney as to whether a murder charge could be proven beyond a reasonable doubt. The District Attorney’s findings and conclusions are not a comprehensive or unbiased summary of all evidence in this case." They further emphasized that Tubby's side of the story will never have the chance to be told nor has justice been served in light of the decision. District Attorney Lasee protected his own. The family of Jonathon Tubby has stated that they will not end the fight for justice here. They have filed a lawsuit, claiming that O'Brien and the other officers at the scene violated Tubby's civil rights. They further demand that there be more cameras installed in the sallyport at the jail. On February 2, the day after the release of the findings the community came together at a rally led by Black Lives United-Green Bay outside the Green Bay Police Department. A crowd of about 30 people gathered from all over the state, braving the sleet and cold, including members of United Action Oshkosh. 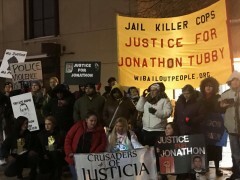 Stephanie Ortiz and Robin Hall-Tinnon led chants of "Justice for Jonathon!" and more, as well as a discussion on what brought each person to the rally. It was clear from everyone that they wanted not only justice for Tubby, but also tangible change in the way the police are held accountable in this country. In her closing statement to the group, Hall-Tinnon stated that it is our responsibility to use collective action for change and to empower others to fight back: "The reality is empowerment is not going in and teaching people empowerment. Empowerment is reminding people of their power." She urged all of the different organizations present to continue to fight in solidarity for justice for all oppressed people and struggle for police accountability.